Today begins the Rugby World Cup, right here in England’s green and pleasant land. When the last World Cup in England kicked off I had only just discovered rugby, I was learning the rules at school and working out how to play the game my way. I can’t remember, but I’m reasonably confident that even then I was in love with the game, a love that has endured and saw me playing for 20 years and enjoying every minute. Nothing will ever come close to the team ethic of putting your body on the line for your guys. Not just once, but repeatedly over the course of 80 minutes, you smash yourself in to the opposition for the sake of your team mates. You leave the field battered, bruised and bloodied and you’ve done it for your club…and I promise you it hurts more than a marathon ever will! You also entrust your safety to the guys around you, especially where I used to play in the front row. If those 7 guys you packed down with didn’t do their job and put it all in to every set piece you could end up face down in the dirt and potentially not getting up again. That level of belief in your team mates, that bond and closeness, is something that running will never replicate no matter how hard your training partner pushes you or club cheers you on. If you watch the games in the next few weeks just see how much effort is put in by guys who never touch the ball or score the points, that’s teamwork. Playing rugby demands absolute commitment to training, every time you hit the gym or pitch. Whereas running asks you to be fit at doing the same thing for a long time rugby is constantly asking different questions of your body. In the space of 60 seconds you can be scrummaging, tackling, mauling and then lifting in the line out, running between each breakdown. There are no easy games in rugby, you can’t choose which days to try for a PB and when to ease off and enjoy the occasion, you have to be at your best, strongest, fastest, fittest and most brutal every time you cross the whitewash. The result of which is an intensity and diversity in training that not only makes you good, but makes you look good to! As for scars, too many to count but every one was hard earned and none of them forced me off the field. I’ve seen people walk off a race course because things weren’t going their way and stay on a rugby pitch after having a dislocated shoulder popped back in. I know which I’d prefer to be remembered for. Never stronger, I wish I could stay this shape and run marathons! Whoever decided to put all races on a Sunday morning and keep us out of the pub on Saturday needs a stern talking too! That aside, one of the beauties of rugby is that for 80 minutes you go to war, intent on causing as much damage as possible to the 15 men in front of you and it gets heated. Then, the final whistle blows and suddenly you’re walking off the pitch with 15 guys you have the utmost respect for and it’s all handshakes, hugs and new friendships and what follows is normally beer, lots of it! It’s as much a part of the game as the scrum or drop goal; the post match meal with the opposition, the jugs of beer for the captain and then all gathering for Final Score or, joy of joys, an international game on the clubhouse TV. It goes beyond that as well, I remember exactly where I was for Golden Saturday during the Olympics, and it wasn’t on a sofa with 8 mates all wearing the badge and cheering like I will be tonight! Rugby brings us together in the pub, at friend’s homes and especially on the terraces of The Shed at Kingsholm in a way running never will. I still see people I played against and stop for a chat now, I’ve never had someone who also ran a race stop me in the street! End of season minibus away day. 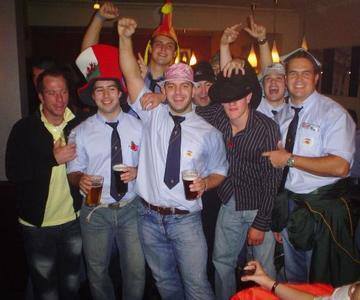 League promotion and silly hats, I miss those days! So there you have it. I love running, but rugby is a part of who I am, and I can’t wait to support my country for the next few weeks. Where will you be watching the games? This entry was posted in Life, Training and tagged physicality, rugby, rugby world cup, running, RWC15, teamwork, training. Bookmark the permalink.